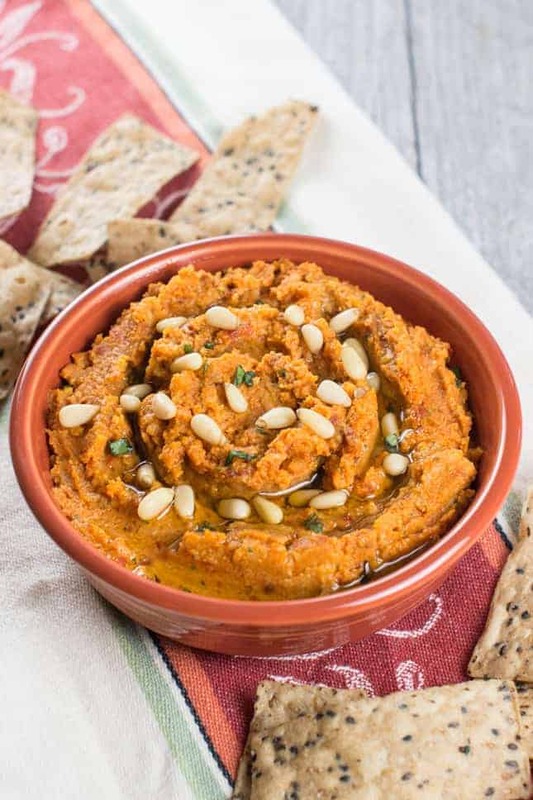 This Sun-Dried Tomato and Basil Hummus is not only perfect for dipping, but can also be used as a spread for your favorite cold sandwich or panini. At least it is in this house. I looked in the refrigerator for some inspiration and found a partially used bag of sun-dried tomatoes I had bought for a pesto and ricotta pizza made on an Ezekiel tortilla (which was ridiculously delicious by the way). Aha! Sun-dried Tomato and Basil Hummus it is! Time to break out the food processor! Move out of the way people…Mommy’s making hummus! After all the ingredients took a spin, I topped off this basil-y, tomato-y creation with some pine nuts. Add chickpeas, sun-dried tomatoes, garlic, basil, lemon juice, salt and water to the bowl of a food processor. Blend until smooth and creamy on high speed, slowly incorporating the olive oil. Stop intermittently to scrape the sides of the bowl. Transfer to serving dish and garnish with pine nuts as well as chopped basil, if desired. Blend until smooth and creamy on high speed, slowly adding the 1/4 cup olive oil as you go and occasionally scraping the sides of the bowl of the food processor to ensure ingredients are evenly distributed. Add the remaining 2 tablespoons olive oil if needed to achieve desired consistency. Transfer to serving dish and garnish with pine nuts and chopped basil if desired. Oh wow! This hummus sounds like it full of flavor. I love sun-dried tomatoes in this. I too was thinking how great your pictures are. We saw this delicious recipe on facebook and had to stop by to read the recipe. We just made sun dried tomato pesto yesterday so this would perfectly delicious as a dip. Great for the after school snacks. Sharing, of course. Gorgeous photos too !